Having never known his father and a mother who was a whore Scott Mary (Giuliano Gemma) has grown up in the town of Clifton, Arizona being pushed around by the other residents with few who really care enough for him to try and look out for him. Maybe that is why when charismatic gunman Frank Talby (Lee Van Cleef) rides in to town that Scott becomes captivated with the cool killer who takes an interest in him. When Frank realises that the locals bully Scott he takes him under his wing, teaching him how to draw quick and shoot accurately with the young Scott becoming even better than his teacher. The question is why would Talby want to help Scott? Two versions of the film are included on this release: the original 114-minute cut that opened in Italy and the more familiar 86-minute version that was released internationally. The Italian release version is dubbed in English and Italian, while the international version is dubbed only in English. • Interview with Director Tonino Valerii - in this archival video interview, Tonino Valerii explains how Day of Anger came to exist, and discusses the film's financial success, its screenplay, the casting of Lee Van Cleef and Giuliano Gemma (initially, the Italian director apparently wanted to cast Lou Castel, but he proved too expensive), etc. The interview was conducted by Roberto Curti in 2008. In Italian, with optional English subtitles. (11 min, 1080p). 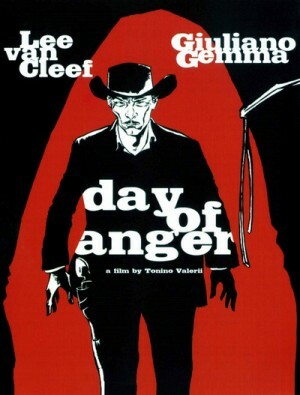 • Interview with Screenwriter Ernesto Gastaldi - in this video interview, screenwriter Ernesto Gastaldi discusses his contribution to Day of Anger, the novel by Ron Barker that supposedly inspired the film (which apparently it did not), the timeless appeal of the spaghetti westerns, the filming of My Name Is Nobody, etc. In Italian, with optional English subtitles. (14 min, 1080p). • Money, Myths and Mortality - in this video interview, Italian cinema expert Roberto Curti discusses Tonino Valerii's body of work, and specifically his westerns, the important role Sergio Leone had early in his career, the casting of Giuliano Gemma as Scott Mary and the mythological references in Day of Anger, etc. In English, not subtitled. (44 min, 1080p). • Deleted Scene - a unique scene not included in the longer Italian version of the film. In English, not subtitled. (2 min, 1080p). • Trailers - US trailer, international trailer, and TV spot. In English, not subtitled. (6 min, 1080p).